Illegal Immigrants Are at a 10-Year Low, So Can We Chill for a Minute? Note that we reached peak illegals (and peak illegal Mexicans) back in 2006 or 2007, right around the time the housing bubble popped and what eventually become the financial crisis started kicking into high (low?) gear. Between 2007 and 2016, the number of unauthorized Mexican immigrants declined from about 6.9 million people to 5.5 million people. These days, illegals are most likely to come from Asia (especially China and India) and to enter the country with legal documents, such as a tourist, student, or work visa and then overstay. Deportations peaked in 2013, when Barack Obama was running the show. Why has illegal immigration from Mexico declined? According to Pew's Jeffrey Passel and D'Vera Cohn, illegals missed their families. One also presumes that the sluggish U.S. economy presented fewer opportunities. According to Mexican government survey data [from 2009 to 2014], most returnees said they left the U.S. of their own accord, and the majority cited family reunification as the main reason for going to Mexico. However, 14% said they came back because they were deported. 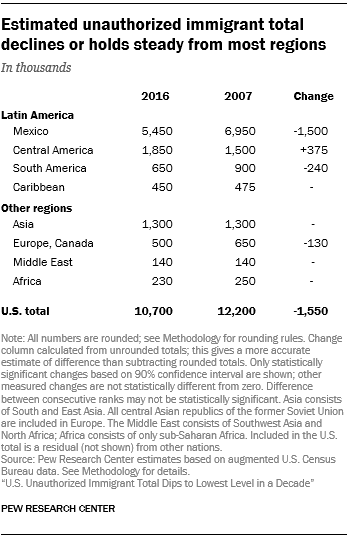 At the same time, the number of illegals from Central America (chiefly Honduras, El Salvador, and Guatemala) has increased over the past decade, from 1.5 million people to about 1.85 million. President Ronald Reagan, eager for a showdown with the [Soviet Union, funded]...the Contra insurgency against the Nicaraguan Sandinistas and paramilitary operations to prop up the U.S.-friendly regimes of El Salvador, Honduras, and Guatemala. Prior to Reagan's intervention, migration from Central America was negligible. People troubled by illegal immigration may find comfort in the trend line of the past decade. But to me, the decline is worrisome. Our problems are only beginning when people stop choosing to come here, whether legally or not. Increased living standards follow economic growth, which follows population growth. And population growth follows immigration. Contra nativist Rep. Steve King (R?Iowa), the only proven way you can maintain your "civilization" is with somebody else's babies. And for all the fears of literal and figurative invasions by supposedly unassimilable Mexicans and Central Americans, crime and most other social pathologies have been declining regardless of the flow and ebb of immigration (both legal and illegal). The real immigration crisis is when newcomers stop showing up. Source: Illegal Immigrants Are at a 10-Year Low, So Can We Chill for a Minute?